NEW ORLEANS–Phelps Dunbar Partner Kim Boyle was recognized as one of “Top 250 Women in Litigation” by Benchmark Litigation for the second consecutive year. Kim was one of four Louisiana women named to the 2018 list, which is selected based upon client and peer review. Kim focuses her practice on labor and employment law, civil rights, constitutional law, commercial, tort, and general litigation. She has built her career representing employers in employment-related claims, such as retaliation and discrimination claims. Additionally, Kim’s practice includes public and private clients in commercial disputes, such as breach of contract, business torts, misappropriation of trade secrets, and unfair trade practices and class actions. Kim is very active in local, state and national bar activities, as well as community organizations and initiatives. She served as the first female African-American President of the Louisiana State Bar Association (2009-2010) as well as the first African-American President of the New Orleans Bar Association (2002-2003). 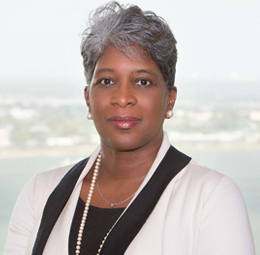 She currently serves as a Board and an executive committee member for Tulane University and the New Orleans Business Alliance. She also serves as Chairman of the Board for the Amistad Research Center and is a Board member for Touro Infirmary. Kim formerly served as Judge Pro Tempore for Civil District Court for the Parish of Orleans, as well as an Assistant Professor of Law at Loyola University College of Law. The extensive research of Benchmark Litigation’s "Top 250 in Women Litigation" encompasses six months of investigation into the individual litigator’s professional activities as well as a client feedback survey and individual interviews. The process culminates in the selection of the most distinguished women in the world of litigation. These women have earned their place among female litigators by participating in some of the most impactful litigation matters in recent history as well as by earning the hard-won respect of their peers and clients. Benchmark Litigation is a leading guide to America’s top litigation firms and attorneys and the only publication to focus exclusively on U.S. litigation. For additional information click here.